I’ve been gathering ideas and supplies for our home office / craft room makeover for a few months. I’ve found a number of items at my local Goodwill that will work great with a little paint and some creativity. 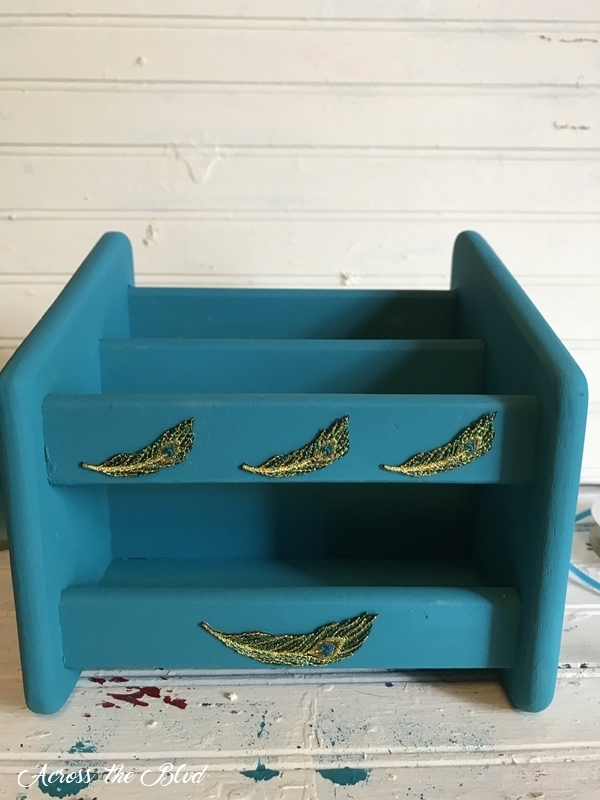 I’m creating a space using a peacock color palette along with several peacock decor pieces. 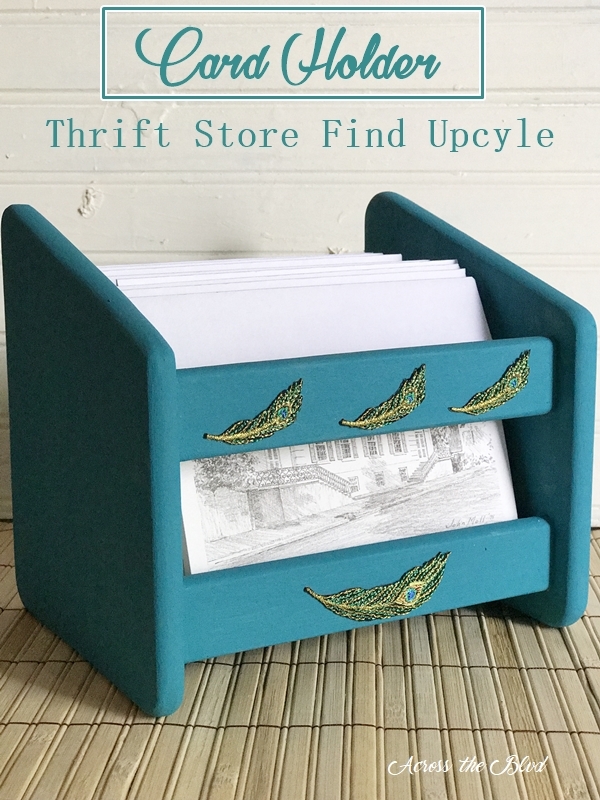 This Card Holder Thrift Store Find Upcycle was the first project. A little paint and some peacock embellishments have it fitting in nicely. The letter sorter was only .99 at Goodwill. It needed a little cleaning with TSP before painting. Once I had it cleaned, I gave it two coats of Waverly Peacock Chalk Paint. I sprayed it with Minwax Polycrylic Protective Finish to avoid scratching the paint away. 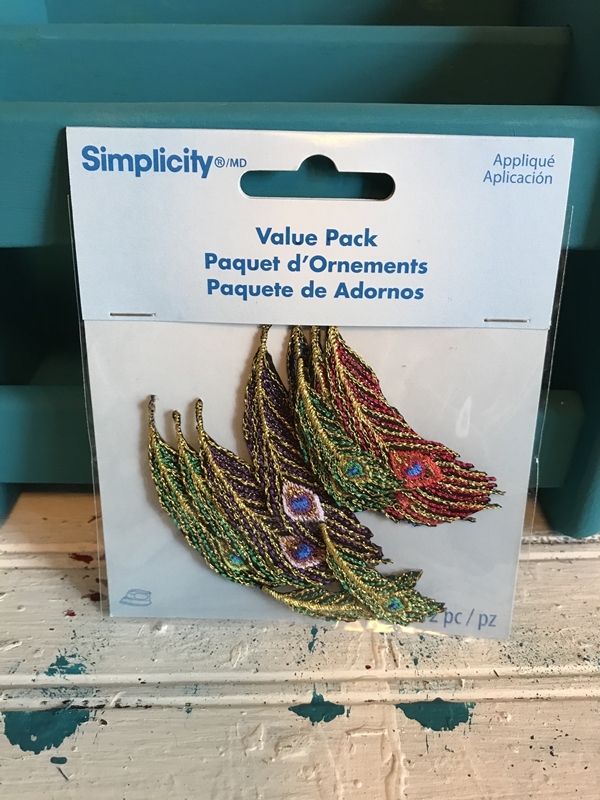 One of the items I’ve purchased while building up my stash of supplies for the room makeover was a package of peacock adornments. I purchased these at Jo-Ann Fabrics and Crafts. I used three of the small feathers and one of the large feathers to embellish the holder. They are hot glued in place. I plan on using this to hold note cards that I send from time to time. I’m enjoying finding ways to incorporate the peacock theme into this space. The room currently has a Tuscan look to it, but I need the space to be brighter. It also needs a more cohesive look to the furniture pieces. I’m using a color palette of gray, shades of blue, and green. I’ll also use some gold accents. This is going to be a time consuming project, but I’m excited to get started. Creating the accent pieces is the easy part and I’ll be sharing those as I complete them. I’ll also be posting updates on the room as I work to give it a fresh, bright makeover. 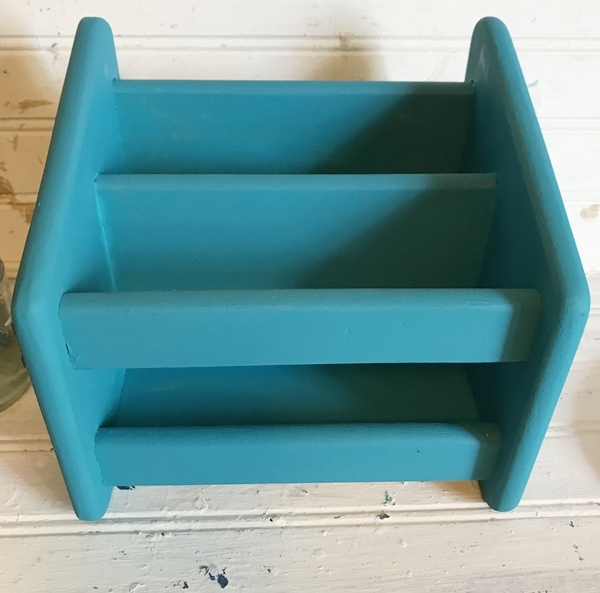 This card holder upcycle was a quick and easy way to begin the room makeover. Beverly, What a great Goodwill find and for only 99 cents! Looks great with the new color and I love the peacock accents. 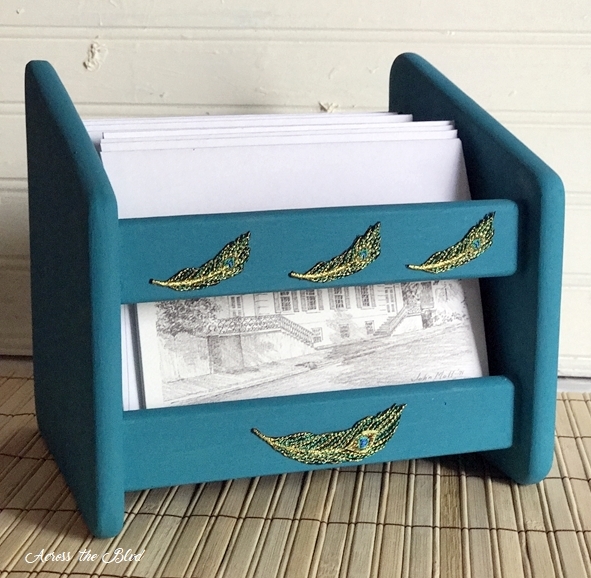 A pretty way to keep the note cards handy. Looking forward to seeing the changes you make in the room too! Loving the pretty new theme! Have a great weekend! Pinning! Thanks, Laurie! I was happy to have found it for .99. I’m working on the lazy susan I mentioned to you after seeing your craft caddy. Thanks for pinning! Hope you have a great weekend, too. Thanks about the blog changes. I’m still tweaking it. 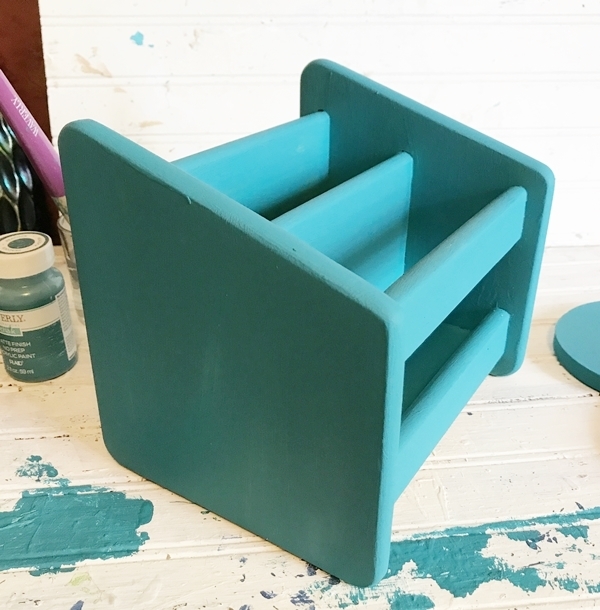 Love the upcycle and the lovely color. 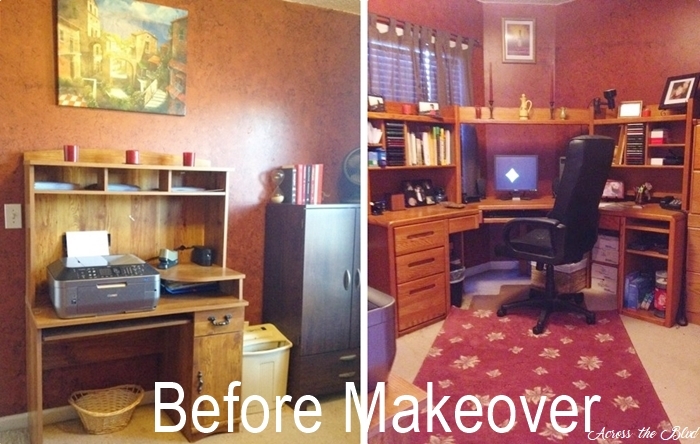 Looking forward to seeing your home office/craft room update. Thanks, Sharon. I’m loving that color, too. I’m excited to be giving the room a long overdue makeover and sharing it. It’s great finding something for a price like that! Thanks, Lisa! Thank you, Angie! I’m enjoying using this color for the room makeover. Thanks so much for sharing. Hope you have a great week. I love that card holder! A lucky find! Unfortunately, writing notes is practically a lost art these days, but i still have mine, and if i had a card to grab out of a pretty holder like yours, i bet i would be more likely to write one. that is the cutest makeover, and a big improvement over what it looked like originally! thanks for sharing it at sweet inspiration this week! It was a lucky find! Note writing isn’t what it once was, that’s for sure, but I enjoy sending them. Having a handy place to store them will make it easier. I’m delighted that you’ve joined Sweet Inspiration as a co-host. It’s a great party. Thanks for stopping by, Florence! Cute and Clever! I always love a great find, especially when you can personalize it and put it to good use. Stopping by today from Over the Moon Link Party, where I’m your neighbor! Thank you, Linda! I love finding bargains at thrift stores, too. Often, the item is just a coat of paint away from being awesome. Another great find with beautiful results. Thanks for linking up at #BloggingGrandmothersLinkParty! Thank you, Christie! Thanks for the party! I love giving thrift store finds easy makeovers to fit in with our decor. Thanks, Sue! 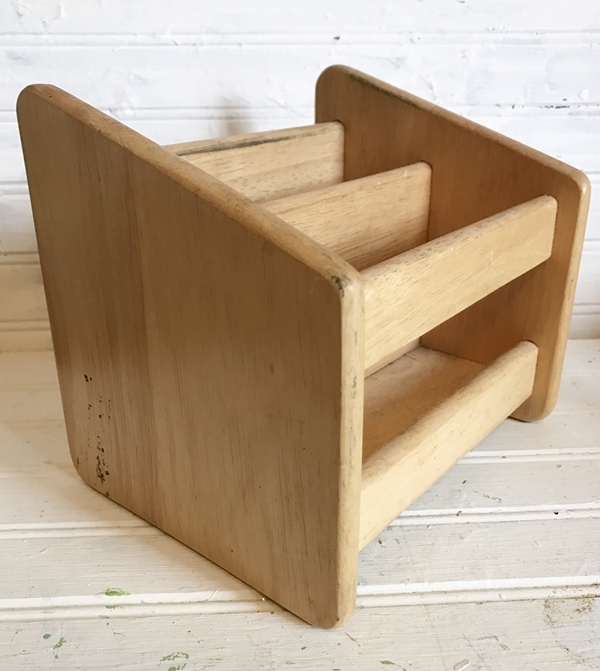 One of most fun ideas of thrifting is what we make of item. You have certainly exceeded ingenuity for re-purposing thrifty finds. thanks for letting us know where you found those pretty peacock feathers, Joanns here I come. Will be looking forward to each segment of your craft room redoing progress, maybe will see an idea I can “borrow”. You are full of great ideas. I used to write letters all the time which friends and family complain of missing. Maybe if I could find something to keep notes in would send more, (also keep them shorter). You are an inspiration. Thank you! 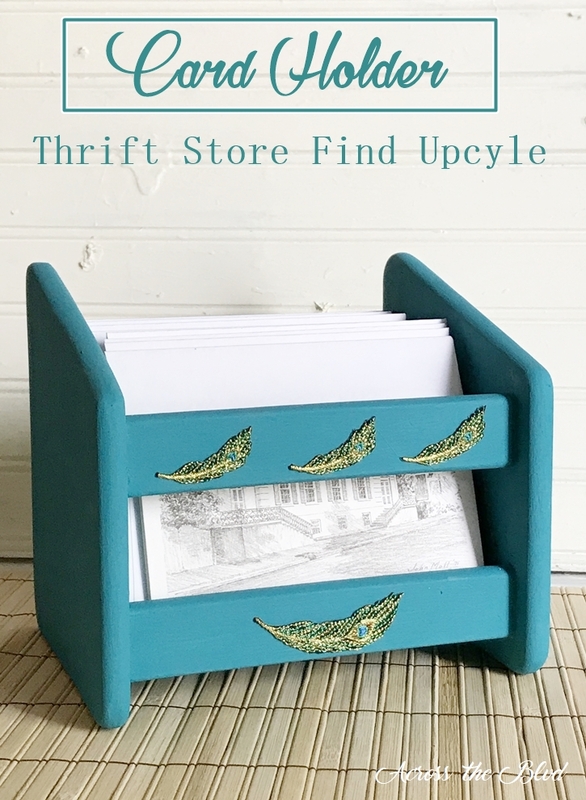 I love finding ways to repurpose thrift store items. I’m excited to be working on this long overdue room makeover. Happy that you’ll be following along, JaneEllen! Can’t wait to see the project’s end. Thank you so much for sharing with us at #BloggingGrandmothersLinkParty. I have shared on social media. Thanks, Clearissa. I’ve been busy working on doing some furniture makeovers for the room. I’ll be sharing those soon. Thanks so much for the shares! this is a great makeover! I love the peacock adornments. they complement the paint color so nicely. Thank you for linking up at #BloggingGrandmothersLinkParty. I’m sharing your link on social media. I’m in love with peacock decor lately and using it in my office/craft room is the perfect spot in my home for it. Thanks for sharing, Carol! wHAT A GREAT IDEA! i NEED ONE OF THESE! Thanks, Lori! It will be handy to have a card holder close by to remind myself to send them. Thanks for the party! WOW! Just 99¢! Your amazing upcycles could be sold. Do you have a shop or just use them in your home? Thank you Beverly for linking up at the #BloggingGrandmothersLinkParty. I shared your post on Facebook, Google+, Pinterest, and Twitter. Thank you! I was pretty pleased with the price on this! I don’t have a shop, though I’ve thought about it from time to time. It’s something that’s on my radar. Thanks for hosting the party and the shares, Dee! I can’t wait to see your room when it’s finished! Thank you for sharing it at the #BloggingGrandmotherslinkparty. I’ve shared on social media! Thanks! It’s a work in progress, so I’ll be posting as I complete various parts of it. Thanks for sharing, Teresa!